Let’s talk about these trees for a second. These are the Prelit Frosted Alpine Balsam Fir trees in three different sizes, 4 1/2′, 6 1/2′ and 7 1/2′ tall. First off, I love the style. They are realistic and so natural looking. 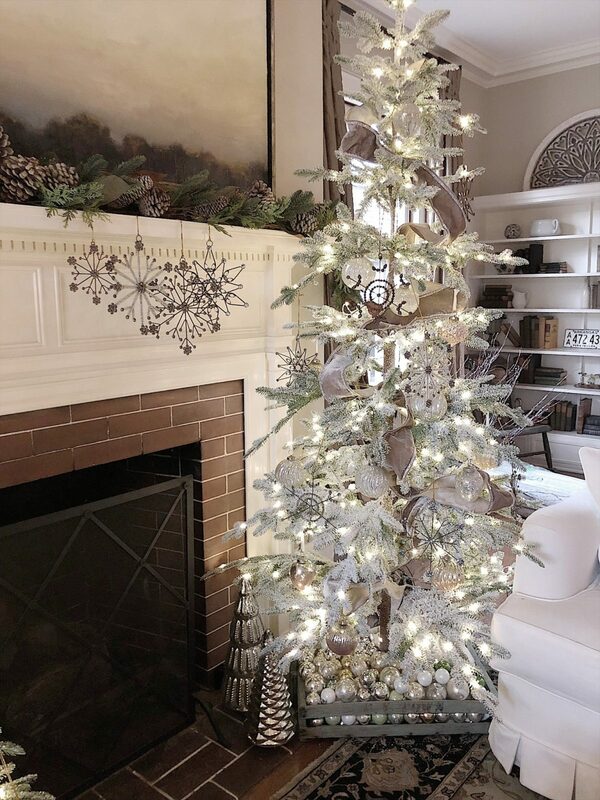 Of course Balsam Hill has a lot of other tree styles too. 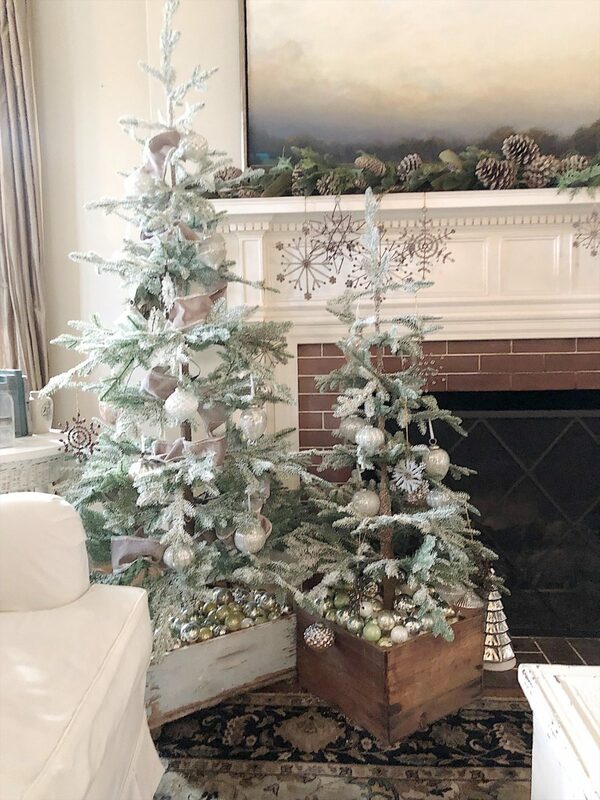 Not only do they take about ten minutes to assemble but each tree comes with it’s own storage bag and two pairs of gloves to use when assembling the tree! You should have seen my husband’s expression when I handed him a pair to put on. Even he was impressed! I love knowing that I will use these trees year after year after year. And that means I will save money compared to buying fresh trees every Christmas. I decided this year I wanted to put all of my trees in vintage crates. I have collected quite a few of these and I love how they look filled with some of my flea market bulbs. You can also use galvanized tubs, buckets, baskets and just about anything to hide a tree stand. 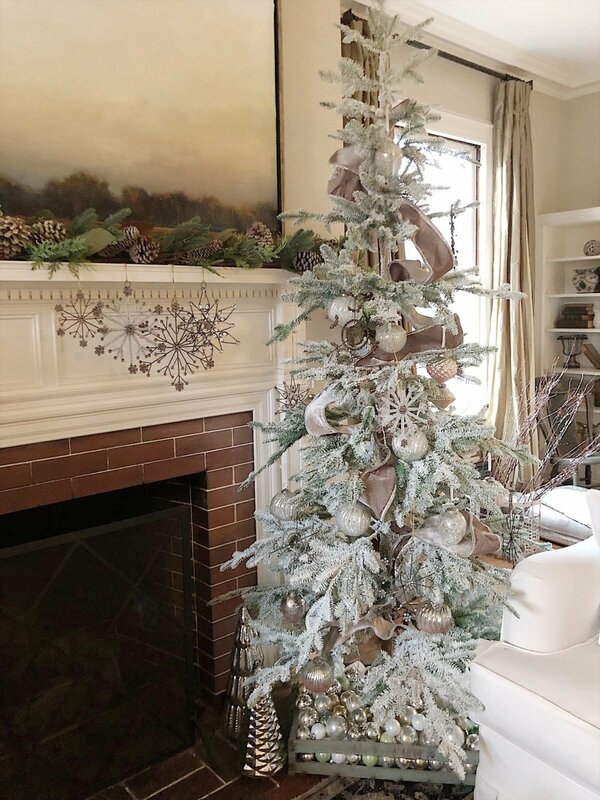 I had so much fun selecting the ornaments and ribbon to decorate my trees. The first ornaments I hung were the Antique Snowflake Ornament Set. 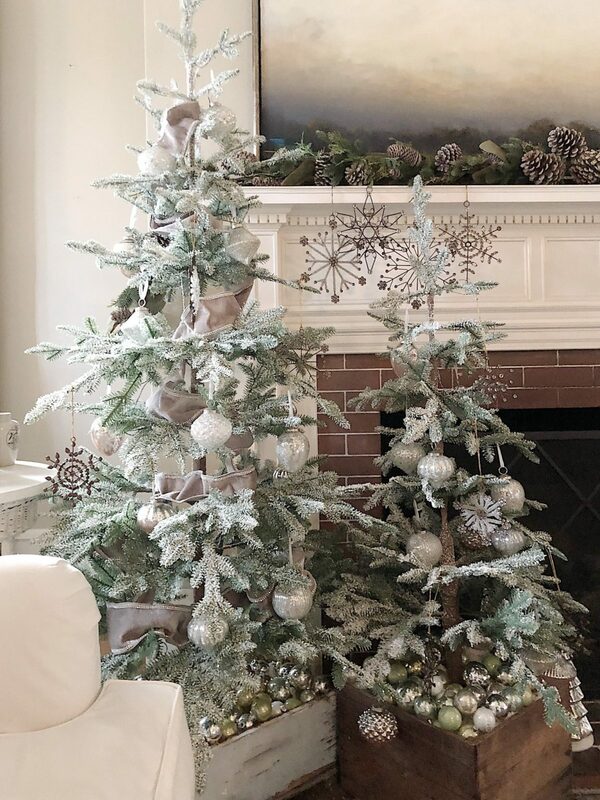 The set includes three different sizes which was perfect to decorate the three different sized trees. 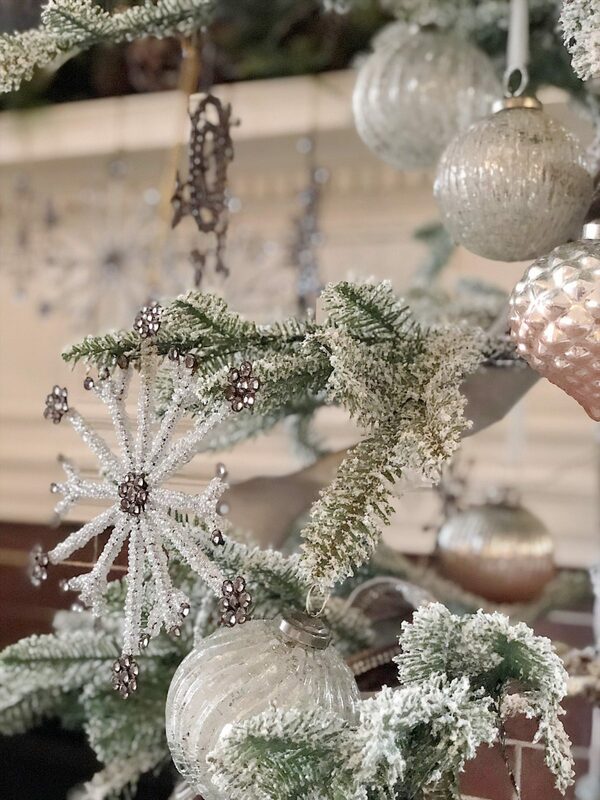 The ornaments vary in size and style. Some have crystal like beads and others have pearls. 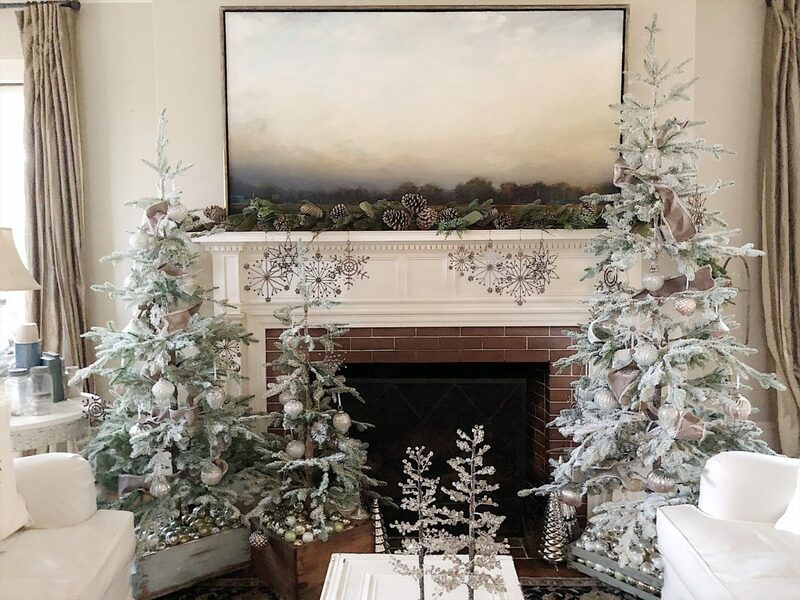 I even had enough of the antique snowflake ornaments left over to hang them on the mantle. Don’t they look fabulous? I also found some gorgeous vintage style ornaments. The white ones are the French Country Ornament Crackle Set. I love that the set has different style ornaments! And don’t they look like they were purchased at an antique flea market? To add some depth to the tree I also selected the French Country Ombré Ornament Set. They have a bit of pink on the bottom of each ornament and I love how they add so much to each tree! There are also an assortment of styles in the set. I love styling ornaments in our home in addition to the tree. 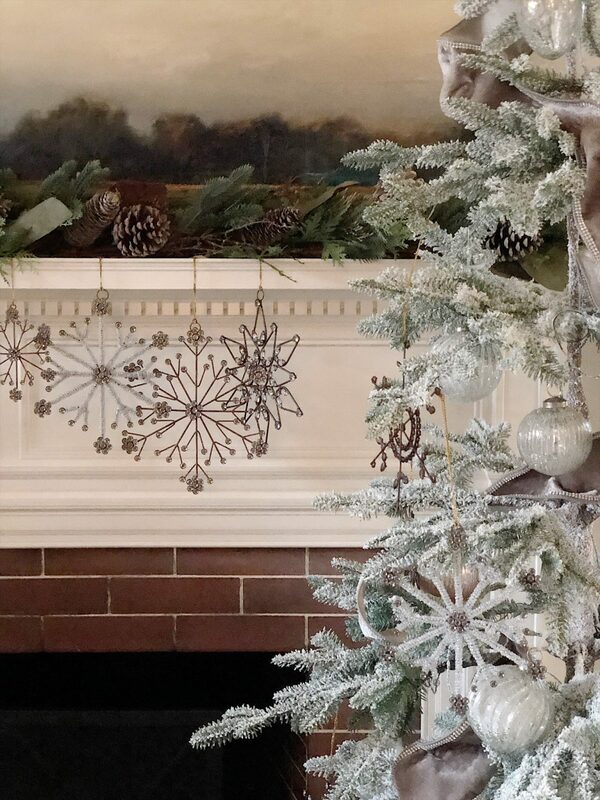 As I mentioned, I added some of the Antique Snowflake Ornaments to the mantle. Then I put some of the French Country crackle ornaments in the metal tray on my coffee table. I made this coffee table from an old vintage trunk and a few ceiling tiles. It’s probably my favorite DIY ever and I think you will enjoy the DIY. These are the first prelit trees I have owned and can I just say, OH MY GOSH. I can’t believe how easy they are to assemble and you just plug them in and they work perfectly! The electricity passes through the stem so it is so easy to assemble the three sections. Look how beautiful they are with the lights on. I also added ribbon to my trees for the first time. I used the Platinum Velvet Ribbon and it is so easy to style! 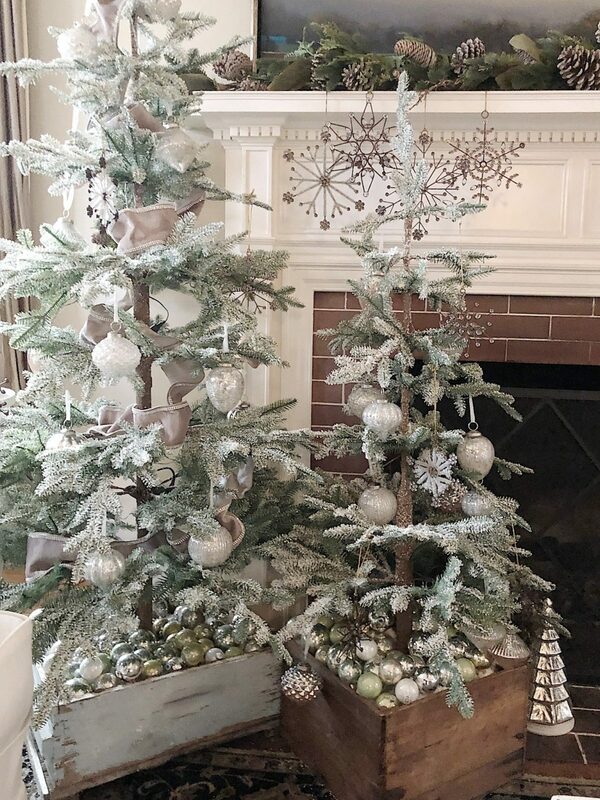 I am going to add ribbon to all of my trees this year because I love how much it adds to a tree. Thanks to Balsam Hill and my friend Courtney at the French Country Cottage for putting together this amazing tour. 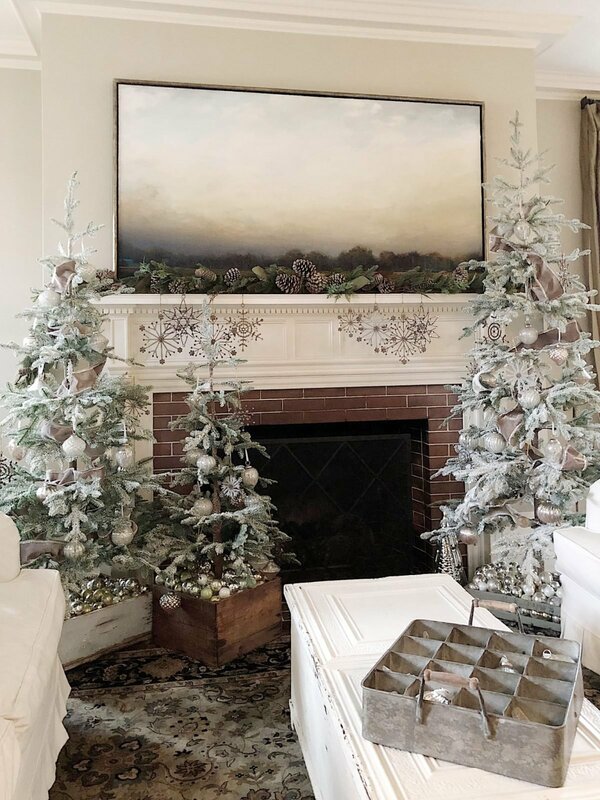 Now you need to visit the four other bloggers and see their gorgeous trees! Leslie this is beyond gorgeous! 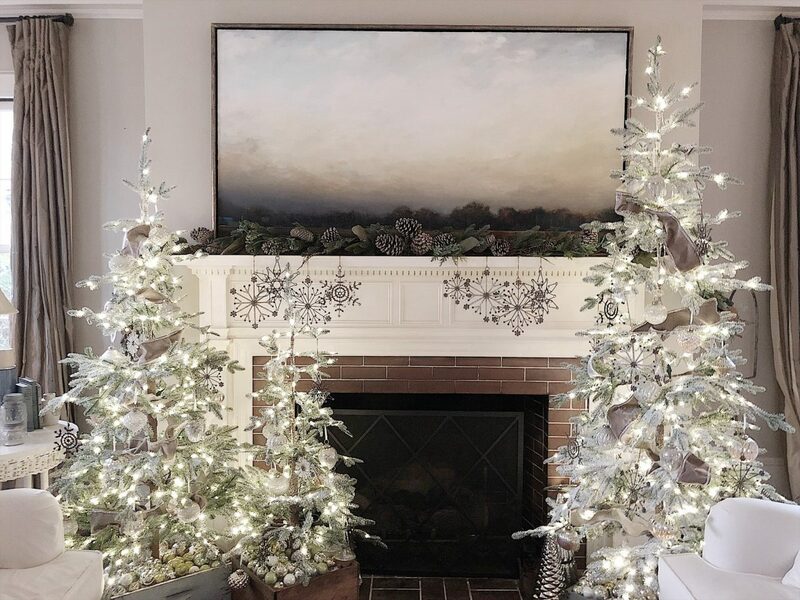 Your living room looks so magical! Your trees are beautiful! Love the crates. Stunning! I love how you filled the crates with ornaments. So much eye candy! I’m assuming that you painted the picture over your mantle?